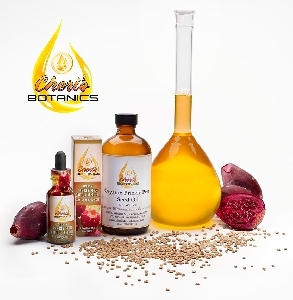 Organic Prickly Pear Cactus Seed Oil is one of the most nourishing oils found in nature. The seeds are harvested from the fruit of the Opuntia Engelmanni Cactus plant grown in the Arizona desert. The fruit is hand-picked, processed to obtain the juice for Cheri’s preserve line and the remaining pressed material, formerly discarded, is now further processed to capture the seeds for its valuable oil. The arduous task of separating the seeds from the skins and pulp, washing, drying and polishing them before extracting the oil makes it a very labor intensive process, but well worth the effort. ABSORBS READILY INTO THE SKIN – The high (60%) content of Linoleic Acid, an essential fatty acid, make it absorb quickly into the skin without leaving a greasy residue. RESTORES ELASTICITY AND BRIGHTENS THE COMPLEXION – High antioxidant activity stimulates cell renewal, leaving you with fresh, new skin. This oil reduces redness and hyper-pigmentation. NOURISHES, MOISTURIZES AND SOFTENS THE SKIN – This oil intensely hydrates the skin, it is suitable for all skin types, but works particularly well on dry, mature skin. TIGHTENS PORES – Essential fatty acids in the cactus seed oil keep the collagen layer of your skin moist and healthy, which helps to keep your pores tight and smooth. BRIGHTENS DARK SPOTS and UNDER-EYE SHADOWS – Prickly Pear Seed Oil has a tremendous ability to brighten the skin and reduce dark spots. The Vitamin K contained in the oil helps to lighten dark under-eye circles. PREVENTS WRINKLES – The immense amount of Vitamin E, 895mg/kg, in the cactus seed oil acts as a free radical scavenger and increases cell renewal. The high fatty acid content plumps the skin, reducing wrinkles and adding firmness, as well as intercepting free radical damage. WILL NOT CLOG YOUR PORES – Due to the high (60%) Linoleic Acid content and a low (20%) Oliec Acid content makes this oil absolutely non-comedogenic, meaning it will not clog your pores and lead to breakouts. GREAT FOR SENSITIVE SKIN – this oil is non-irritating, deeply nourishing and soothing. It calms inflammation and hydrates the skin. The oil from the seeds have a high concentration of Tocopherol (Vitamin E) and essential fatty acids (Linoleic Acid or Omega 6). This oil contains more Vitamin E of any beauty oil on the market (150% more than Argan oil), and the highest percentage of unsaturated fatty acids (88%) – making it an incredibly powerful oil for skin health. Directions: Apply a few drops directly to skin after cleansing or exfoliating. Use around eye, face, neck and décolleté area in light, upward strokes. Or add a drop or two to night or daytime moisturizing crème.